The pair had clashed over the government’s commitment to the North. 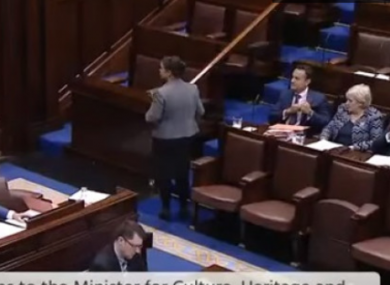 SINN FÉIN DEPUTY Leader Mary Lou McDonald has kept a promise she made to the Taoiseach in the midst of a row between herself and Leo Varadkar yesterday. The Dáil clash saw McDonald asked to leave the chamber by acting Ceann Comhairle Alan Farrell. The pair had locked heads over the government’s commitment to the North. McDonald asked the Taoiseach what he would like Sinn Féin to compromise on in the north, and said she would write to the Taoiseach for a reply to her question. However, the jibes didn’t end there. “It is not a laughing matter,” she said to Varadkar, adding that she was not laughing at the Taoiseach. “I am laughing at the Deputy, not the issue. The Deputy is very cranky today,” replied the Taoiseach. “I’m leaving anyway,” she replied. As she left, McDonald stopped in front of his bench told Varadkar she would “write him a letter”. The letter expands on what McDonald was saying to Varadkar in the Dáil. It says that the government’s attitude towards the Good Friday Agreement and Stormont Executive “raised serious concern”. She said that Varadkar appears “to suggest Sinn Féin abandon [sic] our pursuit of the rights and entitlements” needed to negotiate up North. Harsh words have been exchanged between the pair in recent days, with the Taoiseach yesterday accusing McDonald of being scripted, and stating that she reminds him of Marine Le Pen. Email “Mary Lou keeps her promise to write a letter to Varadkar”. Feedback on “Mary Lou keeps her promise to write a letter to Varadkar”.